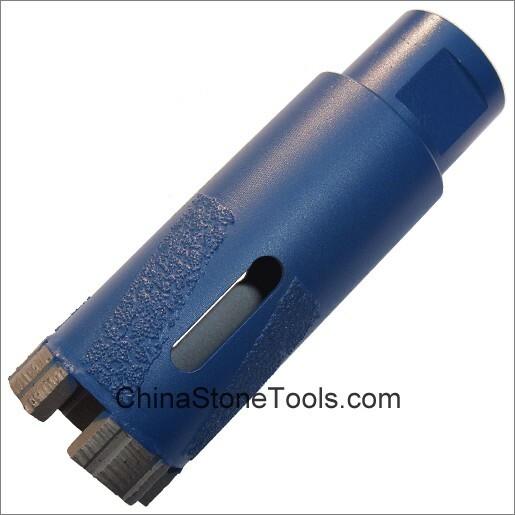 Diamond Core Drill Bits with Turbo segments and pipe diamond vacuum brazed for dry drilling granite or hard stone, common uses would be small projects such as drilling out sink holes for faucets or small holes on slabs. Applications: Kinds of granite or hard stone. Machinery: Suitable for stand drilling machines or Electrical hand-held drillers or CNC machines. Wet or dry use, this type drill bit is specially designed for dry use. Different Bonds are available for Dry drilling all kinds of Granite, Marble, Tiles and masonry, The depth of hole is under 40mm.